MINNEAPOLIS, MN – AMETEK MOCON, a leading global provider of permeation analyzers, package testing instruments and gas controllers/sensors, has launched a new analytical instrument to measure the oxygen transmission rate (OTR) of whole packages under precisely controlled environmental conditions. 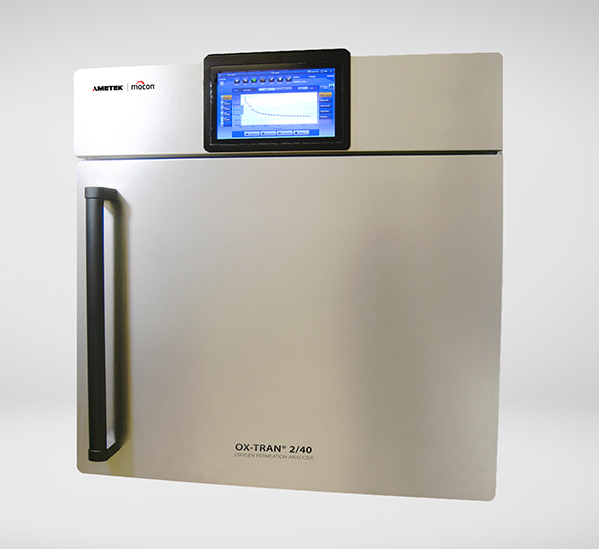 The new OX-TRAN® 2/40 Oxygen Permeation Analyzer for OTR measurements targets package permeation testing for food, beverage and healthcare packaging applications in which knowing the precise oxygen ingress through a package is critical to a product’s shelf life. Applications for the OX-TRAN 2/40 include permeation testing of thermoformed trays, bottles, flexible pouches, corks, caps, and more. Historically, testing the oxygen permeation of whole packages either suffered from poor control of the test gas conditions, since the package was tested in room air, or required cumbersome set up of an independent environmental chamber that was often difficult to use. Adding to the complexity of legacy package permeation testing, package samples needed to be epoxy adhered and heat removed from reusable plates. “With the new OX-TRAN 2/40, whole packages can now be accurately tested for OTR values at controlled humidity and temperature conditions. Samples are changed easily with a new methodology. The chamber is large enough to accommodate and simultaneously test four large packages, each about the size of a two-liter soda bottle,” explains Phillip Tan, Director of Strategic Marketing for AMETEK MOCON. Additionally, this analyzer uses our next generation software platform with automated controls and simple touchscreen display. The industry finally has a permeation instrument that is designed for accurate and easy package testing,” he concludes. AMETEK MOCON is a leading provider of analyzers, instruments, sensors and consulting services to research laboratories, production facilities, and quality control departments in the food and beverage, medical, pharmaceutical, and packaging industries worldwide. AMETEK MOCON is a business unit of the Process & Analytical Instruments division of AMETEK, Inc., a leading global manufacturer of electronic instruments and electromechanical devices with annual sales of $4.3 billion. See www.mocon.com for more information.